It was the equivalent of memorizing the Declaration of Independence but forgetting when it was signed. Or, closer to home, it was like the time his mother concentrated so hard on learning to tap dance in three weeks that she forgot her lines and goofed up the first act of the play for the entire cast. 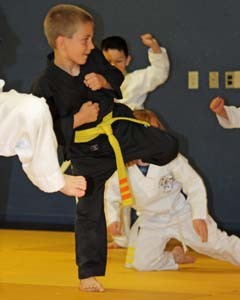 For Big Guy, his gaffe on his path to an orange belt was a minor setback. He earned the belt a week and a half later. But in those 10 days, a 6-year-old demonstrated courage and concentration uncommon in those 10 times his age. He showed the heart of a lion beating in his tiny little chest. I’d like to claim that it was all due to brilliant parenting, but that’s simply not the case. Big Guy came up with it all on his own, persevering in a situation that we’d never gameplanned, one that I’d never even thought to discuss with him. It began two weeks ago, on belt-test day. Big Guy had practiced diligently for weeks, concentrating mainly on a form called Chon-Ji. It was his first form, and its 19 steps continued to torture him two days before the test. “This is the hardest thing I’ve had to learn in my life,” Big Guy said later. Chon-Ji means “Heaven and Earth,” and that’s what Big Guy moved to learn it. By test day, it was halting, but he could do it. Even though he knew that earning the belt was a long shot, he wanted to test anyway because Boots was. “He thinks he can do it now,” I said. Yes, I know he’s probably not ready, I thought. But if he’s determined to learn this lesson, I really don’t think I should stop him. The second time through, he nailed the form he hadn’t known just two days earlier. He earned his third stripe. Now it was time to test for the belt. Maybe it was a letdown from having moved Heaven and Earth, or maybe the brain can hold only so much information without pushing aside something else. When it came time to demonstrate his combinations – three simple moves involving no more than three punches and kicks each – all knowledge of how to do them flew out of his head. At the end of the test, sensei said she’d call Sunday if students hadn’t earned their belts and explain what they needed to do to proceed. When sensai called Sunday, that was pretty much her message. She said she’d have an assistant go over the combinations with him the next day and test him again. He buried his head in his arms and cried. Big Guy was steely-eyed focus as he worked with a senpai before class. After the session ended, he again went before sensai to try the combinations. Boots distracted me, and I didn’t see the outcome. By the time I’d quelled the riot, it was time for Big Guy’s class to officially begin. And I was stunned, not so much that he didn’t earn the belt but that he had held immense disappointment inside him for the entire class. For 50 minutes, he punched, kicked and blocked without letting on. Only when class ended did he let it all out. Brilliant parenting? No. You can’t teach this stuff. You can coach a kid to carry on after disappointment, and you can tell them to keep trying because there will be other chances. But you can’t teach that kind of grace under extreme emotional pressure. A few minutes later, after Big Guy’s tears were over, the senpai he’d been working with put his arm around Big Guy’s tiny shoulders, took him to a corner of the mat and went over the combinations again. The same scene was repeated for the next few classes, with Chon-Ji refreshers as well. This week, Big Guy earned his orange belt. His punches were sharper and his kicks were crisper as a result of the extra work. His heart? As huge as ever. “I just had to let all my crying out and keep practicing,” he said.